Want to know the latest in Jersey news? At Jersey NZ, we believe every farmer deserves the best cows; we believe that cow is Jersey. 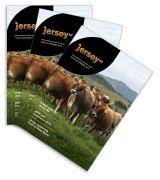 Jersey NZ is a non-profit member organisation dedicated to making Jersey New Zealand’s number one breed. We work collaboratively to provide education, advice, and advocacy for all our members. Talk to us today to discover the benefits of the humble brown Jersey cow. On a per hectare basis, Jersey cows perform better than all other breeds. That’s why we want to work with farmers to see Jersey become the number one breed in New Zealand. At Jersey NZ, we want to ensure the sustainability of the Jersey breed. We take part in genetic gain programmes and can register and sell Jersey cows to improve the quality of your herd. Become a member of Jersey NZ and receive industry-led support and benefits for your farm and herd.